DesignApplause | Lo tek table lamp. Javier mariscal. 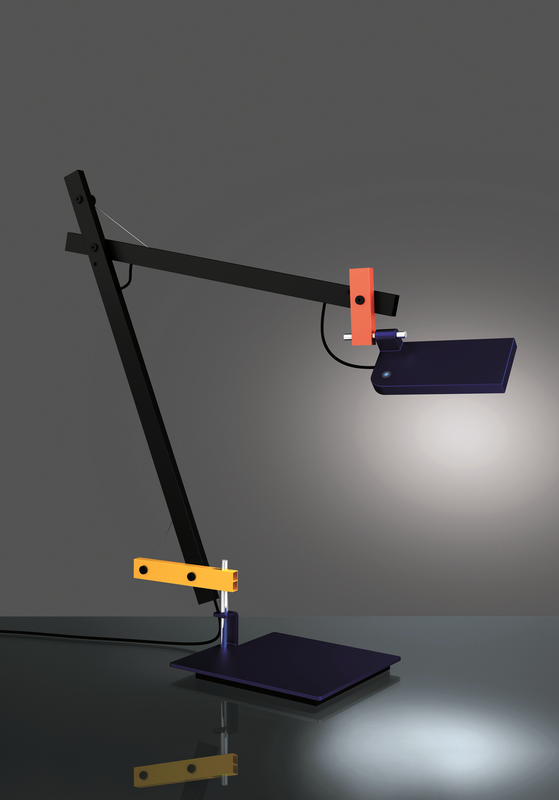 Lo tek table lamp. Javier mariscal. Javier Mariscal is a Valencian Spanish artist and designer whose work has spanned a wide range of mediums, ranging from painting and sculpture to interior design and landscaping. LoTek reveals the Catalan designer’s love of graphics, games and comics. LoTek is an articulated lamp that features essential lines and fluid movements, a design that celebrates its past and looks bright towards the future. 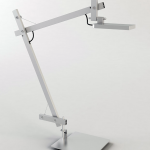 This LED table lamp is made from a pair of moving arms and an adjustable head in aluminum with a steel base. 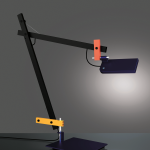 The LoTek Lamp by Artemide features various elements in different colors. Select either a stationary LoTek Lamp with a Base or an easy-to-move-around LoTek with a Table-Clamp. 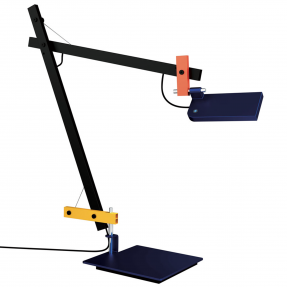 The versatile Artemide LoTek Table Lamp is perfect when used as an office desk lamp but also makes a great bedside reading light. Its light output is plenty strong as well: its 6W green LED light corresponds to a 60W incandescent light bulb and provides 540 lumens and 3000 K of warm white light. It also features an integrated touch dimmer on the the lamp’s head. The LoTek lamp was created from tradition, which is why it is an evolved lamp. 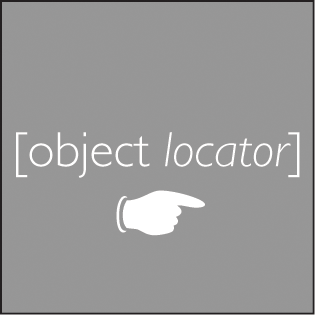 Its past is in its genes and it reveals this through its form, its function and the materials that have been used to manufacture it. The 19th century Industrial Revolution is the origin of its base: a rudimentary iron shape which acts as a counterweight and is the perfect support for an articulated, revolving lamp. 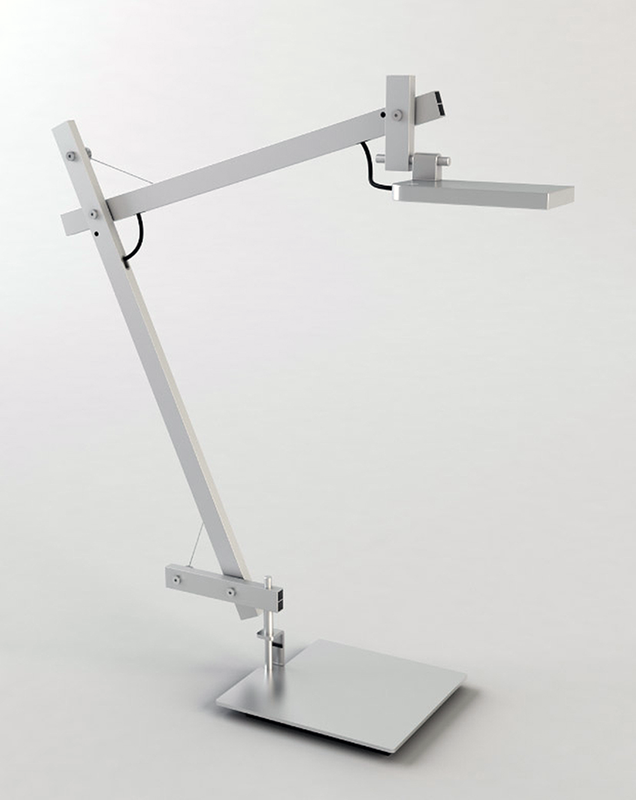 The 20th century is found in the mechanics of its articulated aluminium arm, which has an innovative ball and socket joint, allowing it to move 180° vertically, without friction, and to adopt different positions that give different focuses to its luminous head. The 21st century can be found in the technology of its shade, the LED source of light, a cold light that has a lot of advantages, which include its low consumption. It is turned on and off by gently caressing its head. There is no future without the past. LoTek is a very democratic lamp, with a surprising appearance, a fluid, extreme movement and a pleasant touch.